To be honest, I am not knowledgeable about children books. But since I became a parent, I have become more interested in learning about them. Needless to say, I was very excited when the representatives from Disney Publishing contacted us about author Mo Willems's brand new app, Pigeon Presents Mo… on the Go. 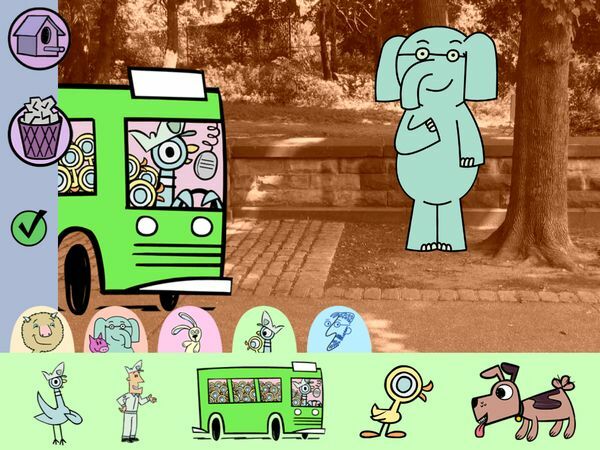 It features many of the beloved characters from Mo Willems' books: Pigeon, Leonardo, Elephant, Piggie, and Knuffle Bunny. I should state up front that this app is not a digital storybook, rather it is a set of interactive games for juniors to play with. When you start the app, you will see five big circle icons representing the five interactive mini games that you can play in this app. You don't have to adhere to a specific order - simply pick the one that catches your interest. I'd suggest starting with Mo's Squillems, a fun game in which you can practice your drawing skills. “Squillems” is a term that Mo Willems coined to represent how a drawing is made collaboratively by two people. You can watch the tutorial video to see how Squillems works. The drawing canvas itself is very simple and straightforward; you can find a pencil, an eraser, and a trash can. Because this is a collaborative drawing, the app will use two color pencils: black and blue. If you're playing with Mo, his lines will be black and yours blue. If you're playing with another person, the first player will use black and the second player blue. The main idea of the game is to be creative. If you are the second player, you will find a button that allows you to rotate the drawing made by Mo or the first player by 90 degrees. When you're satisfied with the orientation, simply start your drawing and the rotator button will disappear automatically. Once this happens, you can no longer rotate or erase the black-colored drawing. All you can do is build on top of it. Another game that my eldest son, Philip, really likes to play is the Dream Drive game. It's a game where Pigeon is allowed to drive the bus, which apparently happens only in his dream. As the bus driver, his task is to pick up all the ducks in the map. Simply drag the bus to pass all the bus stops where the ducks are standing. The only catch is you have to do it in 30 seconds. Philip also enjoys playing with Dance-o-Rama, a mini game where you can select dance moves for Elephant and Piggie to perform on stage. You need to select three pairs of moves from the five options available for each character. Once you've selected all three pairs, tap on the Dance button to see Elephant and Piggie dance. Two other games are Monster Maker with Leonardo and Sticker Pictures with Knuffle Bunny. In Monster Maker, you can play a simple slider puzzle game which lets you mix body parts to create your own unique monsters. In Sticker Pictures, you can snap a photo using the front-facing camera of your iPad and decorate it with various stickers that you get as rewards from the other games. Mo Willems is a fairly successful author of many children's books. Three of his books have received Caldecott Honor, an award for the most distinguished American picture books for children. His most widely recognized work is Don't Let the Pigeon Drive the Bus, which influenced the Pigeon's Dream Drive game in this app. If you like this app and Mo's works, you might also want to check out his latest book: Don't Pigeonhole Me!. It's a collection of all annual sketchbooks that Mo has worked on over the past two decades. If you want to take a peek at the book, I'd suggest you to read this blog post by Mo Willems himself. I really like the design of Pigeon's Dream Drive. It looks like a standard maze-tracing game at first, but once you've finished the first level you'll be prompted with an announcement for the next level: Level 27. Afterwards the level numbers just jumps to Level 343 and Level 7,290. The game difficulty also increases significantly. You start to find roadblocks that prevent you to take certain routes, and then there is the Mad Cow who pursues and tries to hit you. 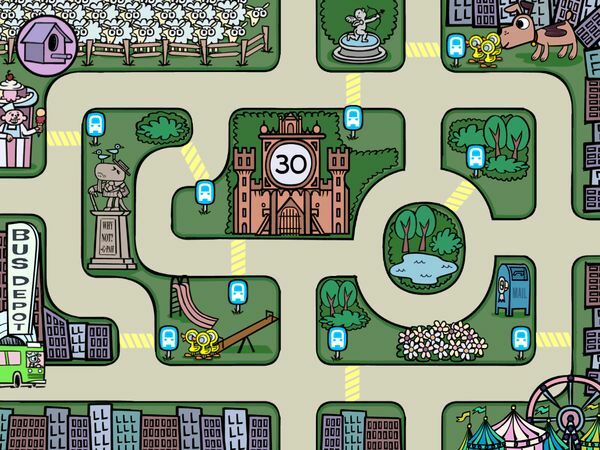 Keep in mind that you can go to the paths on each side of the map to escape from the Mad Cow. If you take this path, the bus will show up on the other side of the map. Regardless, it's better if you plan ahead before start moving the bus. Another thing that I like is how the Dance-o-rama game comes with several dance combinations. 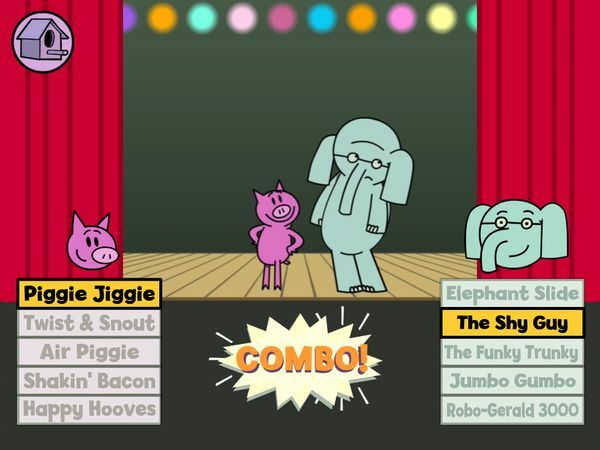 Although each dance move is already predefined, you can select a particular combination to see Elephant and Piggie move differently. And if you're lucky, you might see Mo himself dancing on stage. Here are four combinations of dance moves that you might want to try. Simply select them as a pair to see how the characters move. Get Pigeon Presents Mo… on the Go on the App Store. Note: Thanks to the wonderful folks at Disney Publishing for sharing the app with us. Both Philip and I had a lot of fun playing it. Little Critter’s The Trip Apps. An animated and interactive tale of the Critters family on their trip.